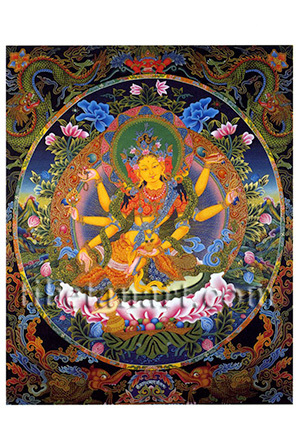 Vasudhara or Vasundhara, the 'treasure holder', is a popular Newar goddess of fertility and prosperity, and a consort of the wealth-god Jambhala. She sits in the posture of 'royal ease' on a moon disc and a pink lotus, with her left leg drawn up and her extended right foot resting upon a white conch shell and a golden treasure-vase. She is beautiful and attractive, as youthful as a sixteen-year-old, and her golden body scintillates with radiant light. Her three beautiful and smiling faces are coloured red (right), golden (centre), and red (left), and she is adorned with the five divine silks and the eight jewelled ornaments. Her first right hand makes the gesture of generosity, while her other two right hands hold the 'Three Jewels' of the Buddha, Dharma and Sangha, and a golden rosary. With her three left hands she holds a small treasure-vase, an ear of grain, and a sacred text. The decorative circular frame or torana of this painting depicts a pair of coiling dragons and the serpent-devouring head of kirtimukha in its upper half, and a pair on makaras or 'crocodiles' in its lower half.